Invite bluebirds into your area with the Home Bazaar Cuckoo Cottage Bluebird House. This home adds an element of design to any bird sanctuary or bluebird trail. Intricate patterns and designs adorn the top and bottom of the home, with pillars on the edges appearing to support the scrollwork. A 1.5" diameter entrance hole rests in the center of the unit, and a semicircular balcony underneath offers birds a convenient place to perch. Detailed posts within the balcony rail bring more design to the piece, and the white color lends a fresh feel. The generous cavity offers room for a brood of bluebirds, and a ladder underneath the entrance hole helps fledglings climb out. Ventilation holes on two sides of the home keep air circulating in the roost, and a drainage hole on the bottom allows water to escape the nest. Use the integrated keyholes on the back to mount the house to a post with two screws. Remove this back panel for nest checks and cleaning at the end of each season, keeping the house free of parasites. The wooden construction and exterior grade paint create a lovely and lasting home. 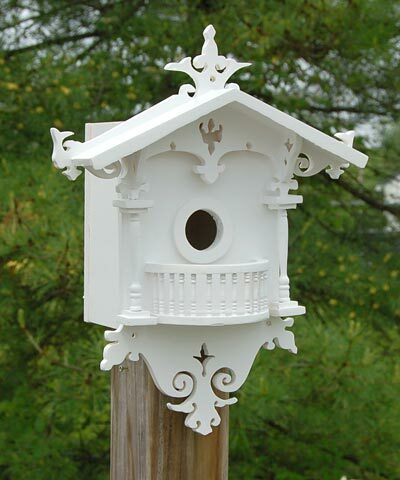 Offer bluebirds an ornate and delicate home with this Cuckoo Cottage Bluebird House.